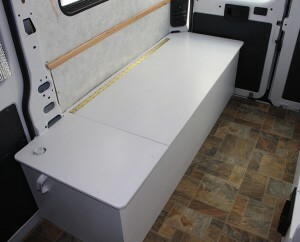 This section provides some information and ideas on beds for camper van conversions. Lots of designs to choose from. In addition to providing comfortable sleeping, the beds often provide a daytime seating and eating area. And, the space under beds are are also often used to house water and electrical systems, and to provide storage. 5 Questions, Comments, Suggestions, Ideas? 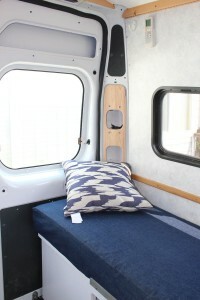 Pinterest is a good source of ideas for camper van beds. 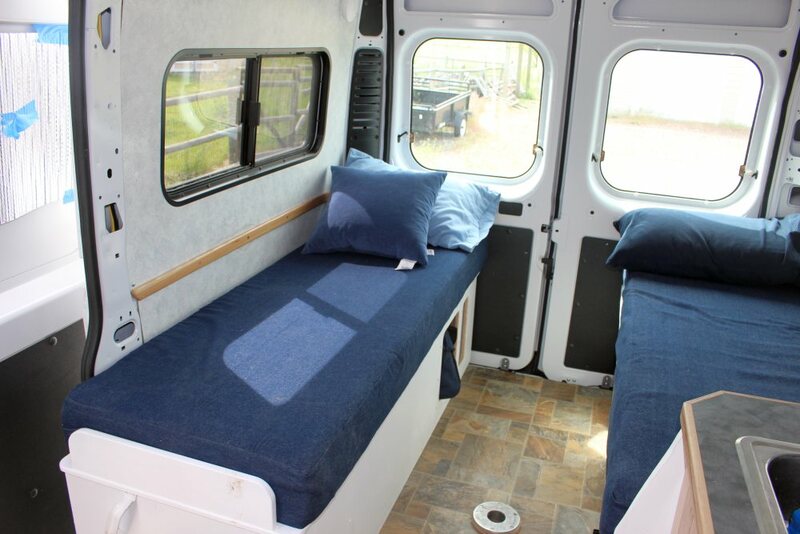 Search for something like “van beds”. DoItYourselfRV has some bunk ideas — just use the site search for “beds” or “bunks”. Looking over the Build Threads on the van forums for ProMaster, Sprinter, Transit, etc. We used a simple set of beds in the aft portion of the van. One bed along each side with an aisle between. The aisle provides an eating area with the beds used as seats. Finished bed platforms with custom mattresses. Hinged lid provides access to storage in bed platforms. 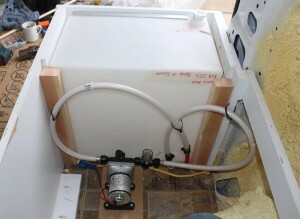 The water tank is in the front part of the bed with storage in the aft part. Galley and bed platforms with electronics inside. Fresh water tank in bed platform. Building the bed platform using MDO. The area under the bed platforms provides the bulk of our storage, and provides a place for the fresh water tank, electrical system and propane tank. The bed platforms have hinged tops to access the storage, but we found that it is also very nice to have some openings in the vertical side of the bed platform for the things that you use a lot. Our bed platform is built from Medium Density Overlay plywood (a premium plywood used highway signs) which is strong, stable, and takes paint well. It is through bolted to the floor to keep the heavy items inside from becoming missiles in a crash. We also looked into a platform across the whole back of the van in which you sleep side to side. This is a nice arrangement and provides for a LOT of storage under the platform. Some of the vans are better than others for providing enough width to sleep in, so be sure to check the width. Space wise, this is a more efficient arrangement than for and aft oriented beds with an aisle between — you might gain a good foot of length. One thing to consider in this is that if you have to get up in the middle of the night, you might end up crawling over your partner. 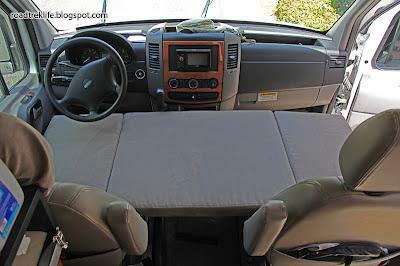 Having owned an RV from a major RV maker with a really bad folding bed, I’m skeptical of folding bed designs. I would make sure you can try any kind of folding bed before you buy it. For our mattress, we had the local futon shop cut a double mattress in half for us, and then had a local seamstress make covers. This has proved to be very comfortable — they are really just as comfortable as our home mattresses. The mattress we selected had memory foam over regular foam for a total thickness of just over 5 inches. There are places that make custom mattresses for RV’s. Like, Mattress Insider, RV-Roadtrips, and many more. Most of these sell standard RV and truck size mattresses (there are quite a few sizes), but some will make custom sizes. You local mattress or futon shop may also have RV size mattresses or be willing to do custom sizes. Lots of places sell foam in various densities and thicknesses, and will cut it to the size you want. This makes a nice simple and pretty comfortable setup. We just use sleeping bags at night, and roll them up during the day to make the mattress available for seating. 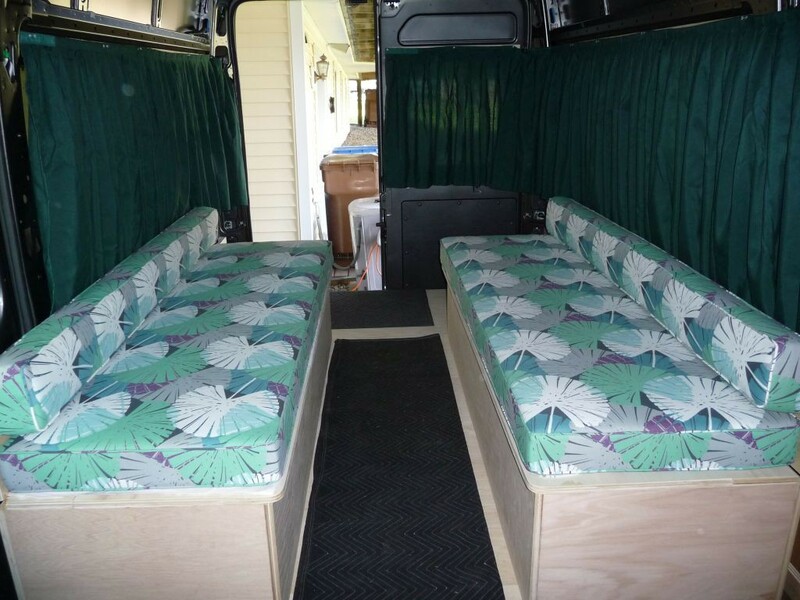 We had thought we might want some cushions to go against the van wall to provide a seat back, but find that just having a few loose pillow/cushions around works fine. Bunk across the front seats. Some vans may have enough space in the area over the cab to work as kid bunks. Bunk beds above a regular bed work — these can be retractable. What about bed in a pulley raised to the roof, that way it can be left made up. I’ve seen it done, but can’t find much online about it. A rope pulley system. We’re planning on working to a budget and living long term. Any ideas where people have discussed this? Yes — I’ve seen at least a couple of those. Kind of mechanically complex, but apparently doable. I likely saw them on one or more of the van conversion forums, so I’d try searching the ProMaster, Sprinter, and Transit forums. Also try googling “camper van bed lift” — this seems to bring up some examples. For those of us who are not talented woodworkers, what do you think about purchasing quality built cabinets and anchoring those through the floor? 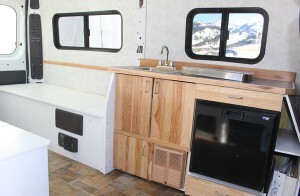 I have looked at several van customization places and, frankly, their cabinets look crummy and cost a good deal. Buying them myself may not save money, but would look better. Do you feel this would be safe to use? Thanks for your help. It seems to me that would work. It would be good to get cabinets with the bodies built with plywood rather than particle board or OSB as the plywood would be stronger. Also good to anchor the cabinets through the floor and also to the sidewall near the top of the cabinet — this is how mine are anchored. 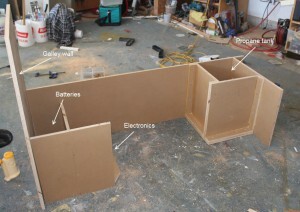 You might want to glue reinforcement pads made from scraps of plywood where the bolts attach to the cabinet. You would want to add the catches that keep doors and drawers from opening when you don’t want them to — these are easy to find online. You don’t want all the stuff to pour out of your cabinet when you go around a corner fast. I think the hardest part might be finding a cabinet that fits into the space you have available. There are some outfits that make kits to convert vans, but I don’t know if the quality is any better. Please let us know if you are able to find a suitable cabinet. Genius! Yours is the first build that I have seen who bolts the furniture through the wood flooring and metal van flooring. I have seen so many people bolting the plywood flooring through the van, then attaching the furniture to the floor with flimsy looking L clasps. What a great idea. Thank you for posting your build out and providing such detail. I am beginning to think that I may be able to do this. One quick question. After you bolted through the van floor and put on the face plates, you painted it with some protective coating. Can you tell me what coating you use? You seem to know of all the high quality materials. Thanks again for sharing your knowledge. Yes — I think its important to have furniture and other stuff well attached in case of a crash. The paint is Rust Oleum brand — I think they call it Rust Primer. I’ve used it on a number of projects and it does hold up pretty well.